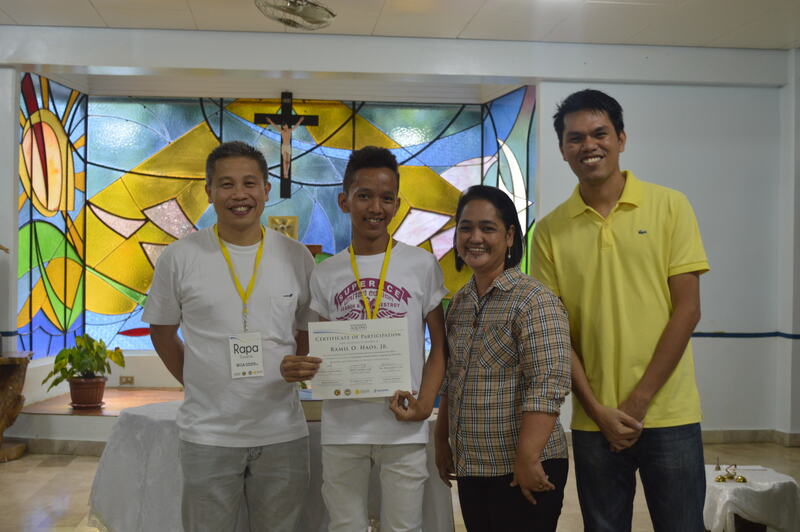 Nineteen student-leaders from the Ateneo De Cagayan – Xavier University joined the thirteenth run of the Ninoy & Cory Aquino Leadership Journey for College Students held last November 14-16, 2014. The NCA Leadership Journey aims to build the nucleus of a new generation of leaders that are grounded on their spirituality who can eventually transform Philippine society. Using Ninoy and Cory Aquino as role models, the program seeks to reintroduce spirituality as a major foundation for Filipino leadership. Harnessing their innate values systems, the participants take part in a process of self-reflection that will ultimately lead to self-transformation and self-commitment for others and country. Below are reflections written by NCA Leadership Journey Batch 13 graduates about the experiences and insights they gained from the program. It is really challenging for a companion like me on how to make my eternal fourth day reflective and responsive to the love of God. After the Journey, my mind is still refreshing the things that I have encountered with my fellow Companions. It was never easy to wake up each morning trying to get over from the process. The day after, my mind was a bit preoccupied in a way that I am still thinking how God taught me to understand my situation, discovered the possibilities and opened my mind to His call to love and serve. Right now, as I mentioned during the sharing, I am in a situation where I‘m still confused and reluctant as to where I‘ll put myself in the first place. To continue serving or not? But now, my mind has the decision to continue serving in our church. Maybe it is not the same way as before but I will never forget that I did answered the ‘why’ in my life as a servant of God. Although I haven‘t put an end to any possibilities like serving in a wider community, I can sense by now that God is really trying to prepare me for the bumpy roads of real life. I am quite unhappy with my life and the situation where I am in. But, because of NCALJ, my heart was opened. Surprisingly, I was contented, happy and loved. With all of my emotions, I know love is the most compelling. I realized that in order for me to be happy, I should always remember how God loved me, and entered into my life. Before the Journey, I was finding all the secrets of the universe but suddenly I came to realize that I don’t have to uncover those secrets because there is only two things for me to put in my mind, “In everything, love and serve the Lord.“ For now, after the three-day journey, I am challenged enough to make things possible not just for myself but also for others in the community. Presently, I am still engaged into being a student-leader and an apostolate in our church because I believe that God placed me there for a reason. He has plans for which I may not realize today but I know someday things will make sense. My Ninoy and Cory Aquino Leadership Journey has welcomed me into the new life of being reflective and responsive to the call of God- Leadership. The call to love and serve. I know in myself that I was born to be a leader. Since grade school I’ve been leading towards fruitful student governance even until now. For me, we are all born to be a leader because we have the capacity to do things, even to those people who have disabilities. Leadership for me is all about service and by serving it is all about empowerment. I’ve been empowering my constituents for almost 10 years and in those 10 years, I have been experiencing happiness, failures, rejections and hardships. Leadership costs something. Sometimes, it costs PAIN and PAIN really demands to be felt. “WHY are you doing this?” For ten years, I didn’t bother to throw this question to myself because I know this is for the common good and there’s nothing wrong in doing good things to other people. And for ten years, I forgot why I keep on going on even if I am tired, even if I am burned out. Passion is just one of the reasons. There has to be someone who’s constantly sustaining my strength, my wisdom and courage and that is God — His unconditional love through His chosen instruments. The Ninoy and Cory Aquino Leadership Journey made me understand that the call to leadership is the call to love. God loved me for who I am, and with that, there is no need for me to change a single thing for Him to love me. I am enough for Him. Even if I do nothing, He still loves me. That’s how God’s unconditional love goes. And because of that overflowing love, it enables me to give love to others in the form of service. This is the reason why I will never be tired in serving the people because again God has never been tired in loving me, even once. 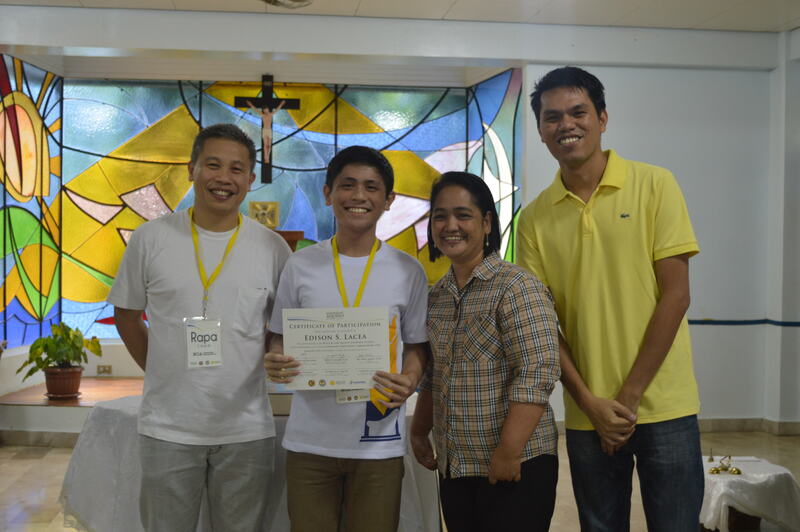 Thank You Ninoy and Cory Aquino Foundation! I hope to face the 4th day of my Journey, with courage, determination and hope that someday, somehow, we will attain what this country deserves. In Omnibus Amare et Servire Domino. Before joining the NCALJ, I was a lost sheep trying desperately to find my way back home. After we parted ways, I was sad because I will be missing my very own version of Narnia. But I guess it was inevitable since sooner or later, we would all begin our eternal fourth day journey. Every day, I made it a point to recite my daily mantra as a guiding principle as to how I live for the day, “In Omnibus Amare et Servire Domino – In everything love and serve the Lord.” It’s a new experience for me but it just feels right when I do it. I began my fourth day by patching up things first with my parents especially with my mother. There were certainly tears but then we laughed and we even got to celebrate her birthday together afterwards. Next, I’ve been participating more in community involvements. Just recently I participated in the campaign ‘What’s your Move?’ that was geared towards the awareness and encouragement of students to observe school policies and regulations such as CLAYGO (Clean As You Go), Magis hour and etc. Lastly, I’ve begun to savor each day. I try to enjoy the opportunity of being alive. It may seem weird but I hug more people often, I pat them on the back, and I’ve said “I love you!” to as many people as I could possibly remember. I can now laugh more, eat more, pray more, and even love more. I’ve become a better daughter, sister, friend and person. My sacrifices are not pinilit anymore. They’ve become pinili – my choice. I’ve never felt so alive and whole. I forgot what it felt like to be right back home again. In summary, my Journey so far has been life-changing. There may have been storms but I can definitely say I’m okay, I’m stronger now with a stronger heart and I hope I can say the same thing too in the future. It has been since a week since that fateful Journey and I am still overwhelmed with what I have experienced and learned. Nakakataba ng puso na isipin at gunitain ang mga masasayang pangyayari sa tatlong araw na iyon. Sabi ko nga sa sarili ko, “Hindi kaya ako mamatay sa heart obesity nito?” But kidding aside, living up to what we have committed will be always a challenge but not hard to overcome now that I fully know that God will always be with me amidst all the obstacles. 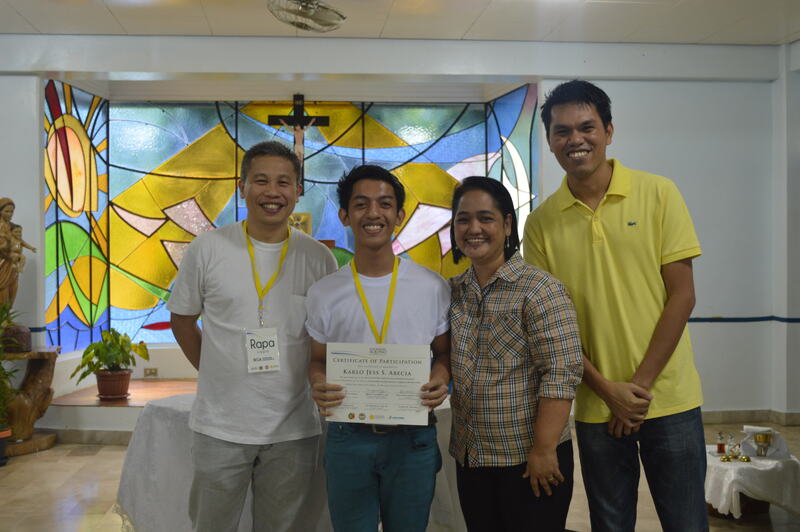 Before the Journey, I’d believed myself to be a non-leader material because I was so focused on maintaining my academic scholarship; I had even doubts as to my application to this formation program knowing my inexperience as a student leader. But then, those three days changed my perspective. God has assuaged my doubts about my capabilities as a student leader. I may not be like others who are charismatic but I understand that in my own way, I could still make a difference in how I lead, serve and love. Love. That I have received unlimitedly not only in those three days but throughout my life without sometimes realizing it. God has lavishly given me His love and I still cannot fully grasp the concept. Love will never be understood within the confines of the mind but with the heart. Having been bullied because of my eye condition, I isolated myself to avoid the pain but I realized that being hurt comes hand in hand with loving. When you see people as they really are and not because of their faults, you realize that everyone is worth loving. We have our own flaws but that makes us more loveable than ever. I have appreciated more the people in my life, thanking them and being grateful for their loving presence in my life. It gave me hope that everything is going to be all right and I could do something to make that hope everlasting not only for myself but most importantly to my fellow Filipinos. 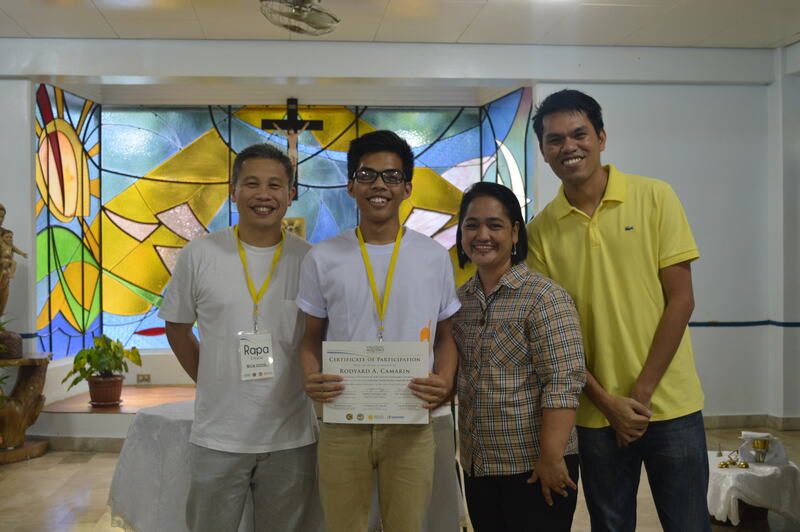 For everything, I would like to thank the Ninoy and Cory Aquino Foundation for this life-changing opportunity. I will always be grateful for this second chance. Nagsimula ang lahat sa katagang aking sinambit gamit ang aking mga labi “NARITO AKO”. Tatlong makabuluhang araw ang lumipas. Tatlong araw na nakapagbago kung sino man ako noon. Tatlong araw na nadama ko ang pagmamahal ng Diyos, nakarinig ng mga testamento mula sa mga taong napagkaitan, sinubukan, nasaktan sa kabila ng ulap ng kadiliman at sa kawalan ng sinag ng haring-araw sa kanilang buhay. Ngunit, patuloy pa rin silang nanalig sa isang Diyos na hindi ko nadama sa buhay ko. Napagtanto ko na may Diyos nga sa ating buhay. Sadyang manhid lang talaga tayo. Dahil sa pagmamahal, kinakailangan nating masaktan. ‘Yan ang tunay na pagmamahal na walang halong maliw. ‘Di ko nadarama ang Diyos sa aking buhay, ngunit nang simula kong buksan ang aking isipan at pandama, aking nakita kung paano gumagalaw ang Diyos sa aking buhay. Marami akong natutunan na tatlong araw na iyon. ‘Di ko na maisusulat sa espasyong ito sapagkat nakaukit na ito sa aking puso at kailan ma’y hindi na mawawala. May Diyos at Siya’y mahabagin. Natutunan ko rin na ang tunay na paniniwala sa Diyos ay nakikita sa mabubuting gawain ng ibang tao. Tinawag tayo upang magmahal sapagkat tayo ay minahal na ng Diyos simula’t sapul. Isang napakalaking hamon na ipagpatuloy ang magandang nasimulan ng NCAF, na ibahagi ang kadakilaan ng Diyos sa iba. Nawa’y ang lamparang sinindihan ng NCAF ay maibahagi ko sa mga walang ilaw sa buhay upang matunton nila ang tamang landas na inilaay nang Diyos. Hindi ako mangangamba na mauubusan ako ng langis sa lampara, ang Diyos ay nagbibigay. Nawa’y maakay ko ang mga tao sa liwanag na biyaya nang Diyos. Nawa’y magawa ko silang mahalin tulad ng pagmamahal sa akin ng Diyos. Sinimulan ko ang bagong paglalakbay na ito sa mga katagang “NARITO AKO” at ngayon sasabihin kong mananatili pa rin ako sa Kanyang kalooban. Nandito ako upang magmahal. True beauty is not something you can see everyday. For some people it comes once in a while, while others die waiting for it to come. Thanks to NCALJ, I am not going to die not seeing the face of beauty. Thanks to NCALJ, I am going to live a life spreading the beauty of God’s love to others. What made the Journey beautiful was that it put into focus the most important, yet taken-for-granted virtue – the virtue of love. It is, in my opinion, a virtue which truly makes us human. The ability to love is inherent in all of us, yet most of us choose to mask it with biases and prejudices. I became a slave to hatred, and the Ninoy and Cory Aquino Leadership Journey freed me from my bonds. The Journey was liberating because it reminded me what it meant to be human. It reminded me that love is the basis for service, that service without love is like bandying empty words to deaf ears. It reminded me that no matter who we are, no matter how unlovable we are to the human eyes, there is always someone up above who loved us first. Just as pain demands to be felt, the Journey also taught me that in a similar manner, love also demands to be felt, and we can feel it through God’s manifestations. Beauty is always an exception, always in despite of. In despite of all the evil in this world, love gives us a ray of hope. This is what I’ll carry on everyday, thanks to Journey. I will carry on with me the fact that someone out there loves me, and because of that I want to love back, and because of that I will SERVE. In Omnibus Amare et Servire Domino. In everything love and serve the Lord. 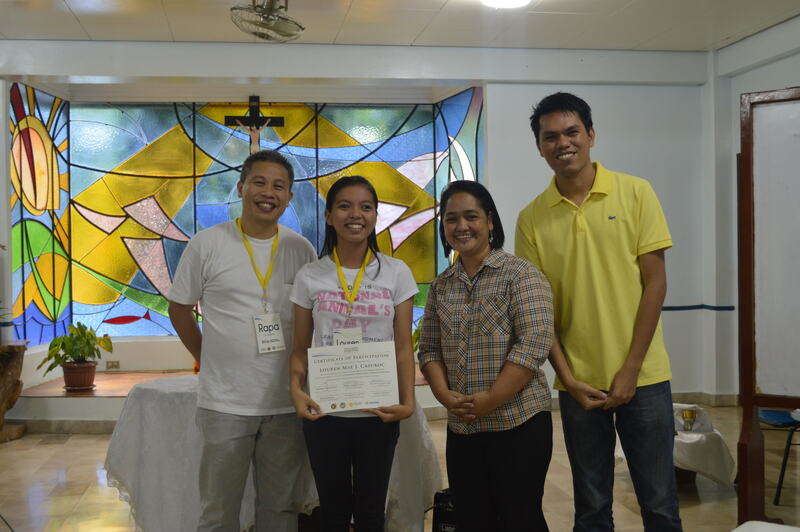 Thank you NCAF and XU-CSG for giving us this truly beautiful encounter with our creator. Thank you for giving us a glimpse of “Narnia”. Thank you Lord for creating everything beautiful in this world. Now, as our journey continues in our eternal fourth day, we shall make it a mission to spread the beauty of your love to the whole world. The world seems to be a race to all of us and because of this we never savor the beauty of life and how this gift is so precious to us. In my NCA Leadership Journey, I truly felt the love of my family, friends, and most especially, my value and worth in this world because God loves me. All we did was just simple but it made a significant impact to me. I’ve realize how listening is important. Listening is a simple thing but through it I can know myself better. I can know how others feel and because I listened to my heart, I felt how much God loves me. Any act of sincerity will always bring impact to someone. 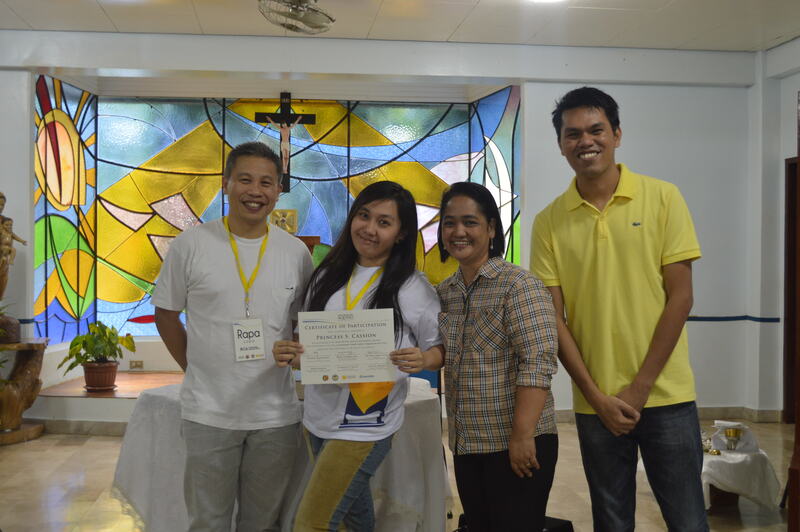 It is heartwarming to see the facilitators doing everything just for us to have a wonderful experience to bring home. All they did were made sincerely. I am moved by it and it caused great impact to my journey. They made me feel that God loves me. Ninoy and Cory are not here with us anymore but their legacy remained. Many people are still embodying the values of these two great heroes because they have shown and they made many Filipinos feel the true spirit of a leader. 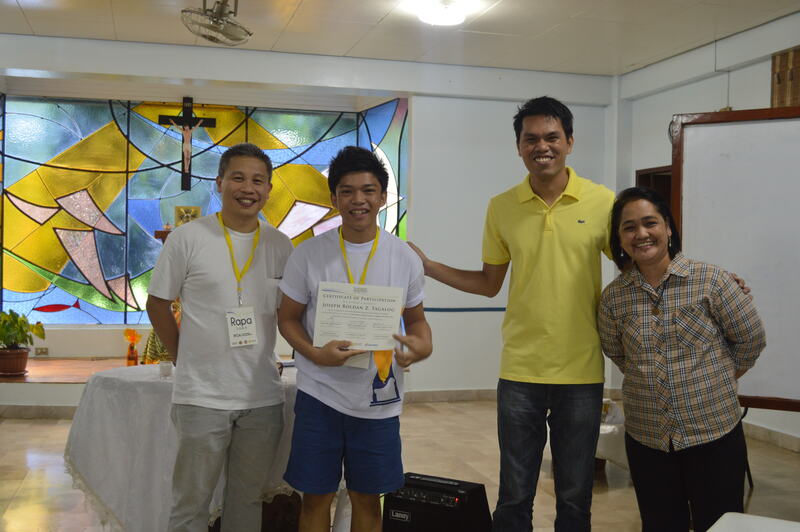 Their spirituality as a leader made me realize how God loves me. NCA Leadership Journey made me realize how I am loved by God. This love will fuel my Spirit to do things with sincerity to be able to spread the love of God on my eternal fourth day. This love will always motivate me to do Simple things with great love. With God’s love I will make greater things happen!